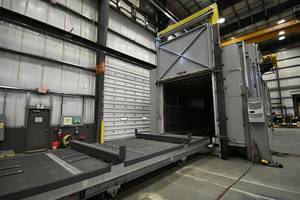 Wisconsin Oven Corporation shipped natural gas fired two zone conveyor ovens to a leading supplier of the automobile industry. 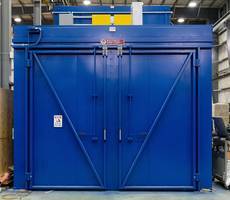 It will be used for stress relieving automotive springs and can heat 11,000 pounds of springs per hour. The chamber dimensions of the oven are 11’3” wide x 24’3” long x 14’0” high and the maximum operating temperature is 650°C (1202° F). It is designed with bottom-up airflow to maximize heating rates and temperature uniformity. 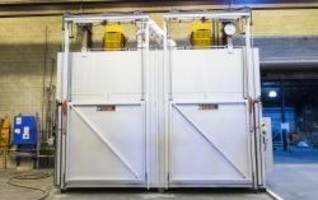 It features a programmable temperature controller, a digital process high limit controller, digital recorder, variable frequency drive and a heavy duty flat wire belt. 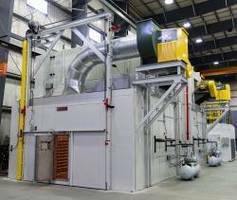 Wisconsin Oven Corporation announced the shipment of a natural gas fired two zone conveyor oven to a leading supplier of the automobile industry. 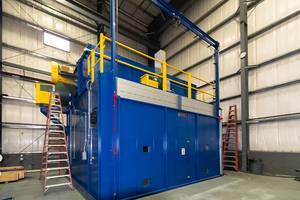 The conveyor oven will be used for stress relieving automotive springs and has the design capacity to heat approximately 11,000 pounds of springs per hour. The overall work chamber dimensions of this stress relieving oven are 11’3” wide x 24’3” long x 14’0” high. The maximum operating temperature is 650°C (1202° F) with guaranteed temperature uniformity of ±5°C at set points of 520°C (968° F) and 570° C (1058° F) to ensure the conveyor oven meets the CQI-9, 3rd edition process Table E for stress relieving/annealing. The gas fired conveyor oven is designed with bottom-up airflow to maximize heating rates and temperature uniformity based on the part load configuration. 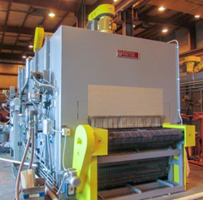 Profile curtains are located at both ends of the conveyor to reduce heat spill-out. The continuous belt conveyor system utilizes a variable frequency drive to provide adjustable speed control. 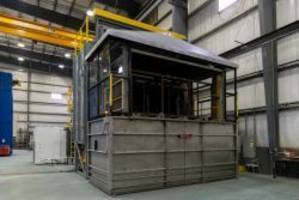 This stress relieving conveyer oven was fully factory tested and adjusted prior to shipment from our facility. All safety interlocks are checked for proper operation and the equipment is operated at the normal and maximum operating temperatures. An extensive quality assurance check list was completed to ensure the equipment met all Wisconsin Oven quality standards.